Home > KidsOut News > 2018 Southampton Gala Dinner raises over £64,000! 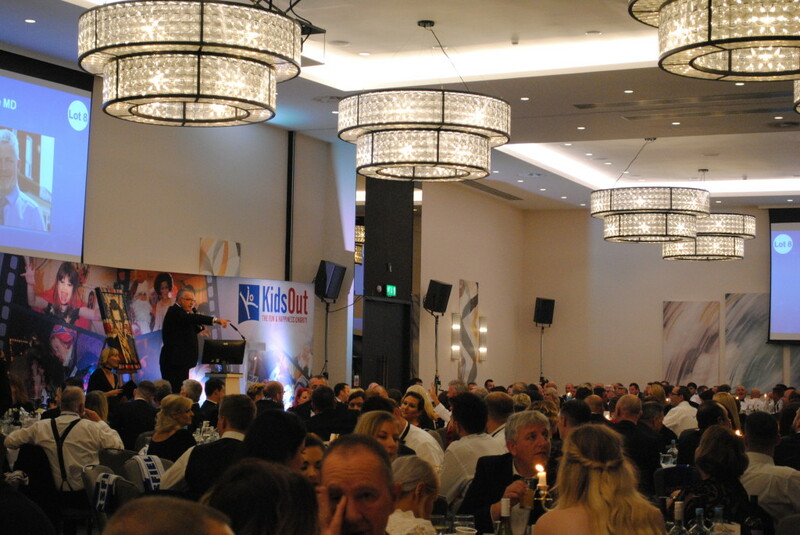 KidsOut’s 2018 Southampton Question of Sport Gala Dinner was another great success, raising over £64,000 for the charity. Over 400 people from Hampshire based companies joined KidsOut at Southampton’s Hilton Hotel at the Ageas Bowl for a night of fun and fundraising on Friday 12th October. We were thrilled to have comedian Mike McClean hosting the event, alongside quiz master and football legend Peter Shilton. Topping the Champions League was Moore Blatch, while the Europa League was won by Bargate Homes Ltd. Well-deserved victors! 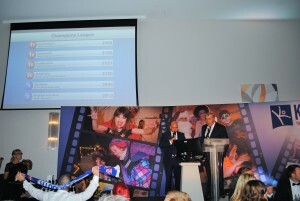 In addition to the main quiz, guests could also take part in a raffle and two auctions. There were some fantastic items up for grabs in the silent auction, including a voucher for a bespoke suit at McCann Bespoke Tailoring, a signed boxing glove by Anthony Joshua, and a vinyl copy of Queen’s Greatest Hits signed by the band members. Available in the main auction was a unique Keith Richards painting by Hertfordshire artist Rob Bishop, an exclusive Yacht experience on ‘Shamu’ for ten people, as well as a pair of VIP tickets to see the band Take That in London along with an overnight stay at the Intercontinental Hotel. We are sure the winners and highest bidders of our raffle and auctions will enjoy their fabulous prizes. Each year KidsOut offer awards to four people or companies for their outstanding support and contributions to the charity. At this event, KidsOut were happy to present an award to Moore Blatch for “Company of the Year”. Moore Blatch has been fantastic in sponsoring our Southampton Question of Sport for many years and this award was meant to signify that their ongoing support does not go unnoticed at KidsOut. KidsOut would like to say a huge thank you to the Gala’s event committee, as the Question of Sport event would not be possible without their help and support. In particular, thank you to the chair of the committee, Glen O’Nion. KidsOut also would like to thank Barratt Homes Southampton for their invaluable support in helping to organise the event. The money raised will be used as vital funds to continue to supply Fun Days and Toy Boxes to disadvantaged children in the Hampshire area, helping KidsOut bring fun and happiness to disadvantaged children throughout the UK. A special shout-out is also warranted for the volunteers from Moore Blatch. Their help on the night was essential in ensuring the event was a complete triumph. The date of the next KidsOut Southampton Question of Sport is Friday 4th October, 2019. Keep the date free in your calendars and be sure to stay up-to-date with our Facebook and Twitter pages for an official announcement soon.